It's not uncommon for people to think that you can't indulge while still being healthy. What they don't realize is that is a totally false statement. You CAN indulge while still being healthy and these tasty little treats are proof! Snickers have always been one of my favorite candy bars. I love the caramel, the nougat, the crunch of the peanuts and, of course, the chocolate. Have you looked at the ingredient label on your favorite candy bars lately? Don't. You do not want to see what you've been eating. Chances are you won't be able to pronounce half of it anyway. 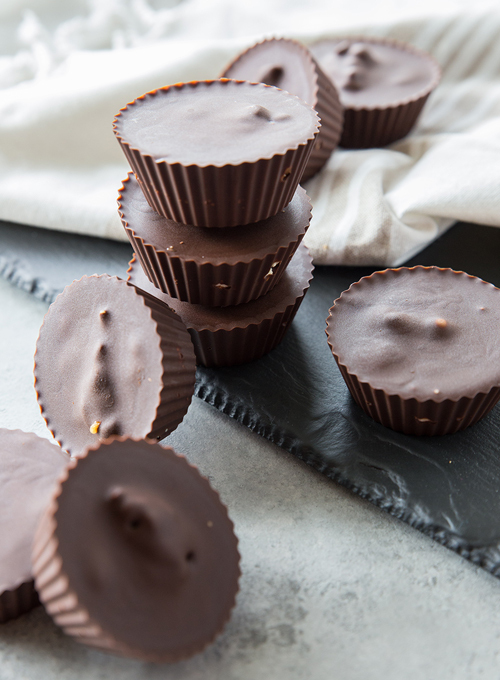 Insert my homemade version of healthy Snickers to the rescue. What I love about making treats and things at home is that YOU get to control the ingredients. You know exactly what goes into it and what you're ultimately putting into your body. This decadent dessert is totally guilt free and incredibly easy. I've stashed mine away in the freezer for a 'rainy day' when I've got a hankering for something sweet. I made them regular size – but next time want to try a mini size of them (as the regular are big enough to cut in half and be satisfying!). Add chocolate to a heatproof glass bowl. Fill saucepan with 2” of water; bring to a simmer over medium heat. Rest bowl over pan and cook until chocolate has melted. Set aside. Add dates and peanut butter to Twister jar, blend on a Medium speed for 1-3 minutes until smooth. Add water to reach desired consistency. Fill a muffin liner (silicone works best) with 1 tbsp melted dark chocolate. Top with 1 tsp caramel filling. Sprinkle with about 1 ½ tsp chopped peanuts. Cover with 1 ½ tbsp melted dark chocolate. Refrigerate or freeze until firm and remove from liner. Store in refrigerator. When she’s not at work or spending time with family or friends, chances are you’ll find Yvonne in the kitchen wearing an apron and a smile. Her passion for cooking and baking is endless and her appetite for trying out new and tasty recipes is unquenchable! In fact, that’s why the name of her recipe website is TriedandTasty.com. Yvonne slices, dices, and sautés her way through an abundance of new recipes on a regular basis and delivers only the best to her site’s treasured visitors. Please call our customer service team at 1-800-748-5400 and they can help you figure out what model you have!